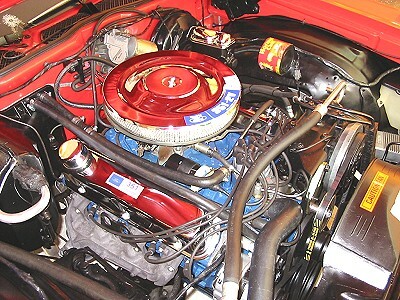 This is the original 351 Windsor with 2-barrel carburetor - completely stock except for the chrome air cleaner and valve covers. It was rebuilt by Gopher Engines in August, 2003. While the engine was out, I detailed the engine compartment. Read More about the Engine Rebuild. That's it! Tour's Over! Unless you didn't start at the beginning, in which case you need to just keep hitting "Next" to continue.